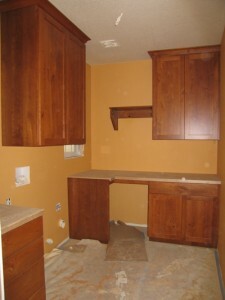 The cabinets that grace the master bedroom and bathroom are a stained Alder. Alder is a soft hardwood of medium density with a smooth surface and reasonably straight grain. Its natural color may vary from almost white to tan and pale, pinkish brown. It takes stains relatively well and blends well with walnut or cherry woods. The cost for Alder is reasonable, making it a great substitute for the more expensive walnut and cherry woods. 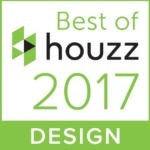 The following is a list of projects from our portfolio that have alder cabinetry: Design & Function, Alder/ Corian kitchen remodel, Alder kitchen remodel and sunroom addition, Alder/Granite kitchen remodel and entry, and Cambria kitchen remodel. Rustic Cherry was chosen for the laundry room for its dark pitted knots and elegant grain pattern. In its raw state, it has a pinkish-brown hue with occasional shades of white, green, pink or even grey. 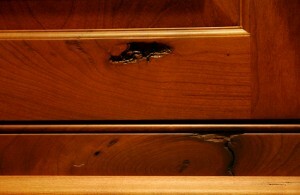 Cherry wood will naturally darken with age but can always be given a little help with stain. It is a beautiful wood and rustic Cherry costs about the same as clear Alder. The stain we chose for the laundry room is a medium reddish-brown that will compliment the red countertops (yes, we said red) and multi colored Marmoleum floor. There are two different cabinet woods in the kitchen. 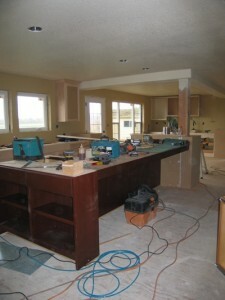 The main kitchen cabinets and dining room cabinets will be painted with a bead board inlay. These cabinets are made out of soft Maple. 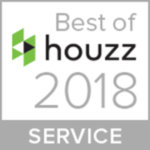 Soft Maple is used for its hardness, the ease and quality that it takes paint and it is inclined to not warp as bad as Poplar (another common paint-grade wood). The kitchen island will be made out of Sapele. Sapele is an imported hardwood. Its heartwood is red to dark reddish-brown, usually with a purple cast. On quartered surfaces the wood presents a well defined ribbon striped figure. The grain is interlocked or wavy and the texture is fine. One of the pros for Sapele is that it’s stronger than African or American Mahogany and Red Oak. It is a good choice for homeowners who may be a little rough on their cabinets. The cultured marble surround for the bathroom shower has been installed. This is a white on white swirl pattern but there are several colors and patterns available. Cultured marble surrounds are an upgrade from the standard fiberglass surrounds and easier to clean than tile surrounds. 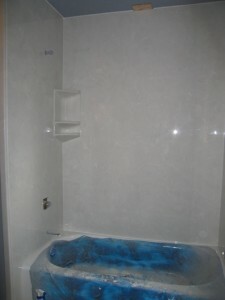 The blue stuff in the picture is tub protection that we brush on to protect the tub from damage. There’s a pristine white tub under there waiting to be unveiled. The tile installer has also been busy installing backer board in the master bath. 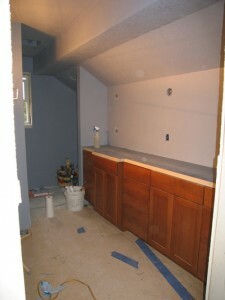 The next post should have some pictures of set tiles and more cabinets installed.